As the start of the heating season (that time of the year when boilers throughout the country are switched on and the “fights” over the thermostat settings ensue) draws near, we’re seeing the usual articles and guides providing advice on how to cut your energy bills pop up on various news outlets. One of the most common suggestions is to turn off radiators in unused rooms and add thermostatic valves to radiators you do use. When the room is warm, home owners should switch off the heating, as the residual warmth will continue as the radiators cool down. This is a very sound piece of advice, however, the truth of the matter is that most of us simply forget to do so, with the end result being that we heat rooms in our houses that we don’t actually use. 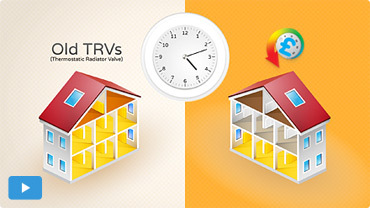 For this reason, more often the not, the best way to actually implement the piece of advice mentioned above is to install a system designed specifically to help you manage your heating and radiators better – such as the HeatSave wireless thermostatic radiator valves.